2' x 1'1" x 2' 8"
There are four bookmatched figured panels. 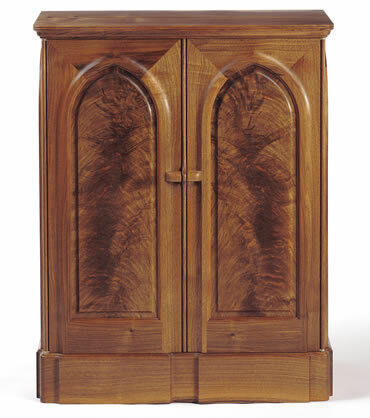 With a strong vertical emphasis of the moulded base and stiles, gothic seemed the appropriate shape for the tops of the frames of this cupboard made for a victorian house, making the eye move up and down the piece. The door handles which nestle between the coved door mouldings and then reflect them, creating another gothic arch in plan, provide a focal point for the design.